Vintage Rare Tupperware Sippy Cup And Dish X2 Flower Pattern , non spill. CRYSTAL WAVE 3155. MICROWAVE SOUP CUP. 6 Sundae Dishes - no lids. Most of my prices are "firm and haggle-free". OTHER INFORMATION. 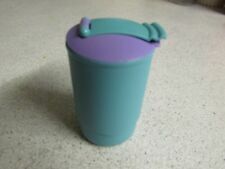 Vintage Tupperware Joblot Cups, Small Boxes Lids Etc Please see photos for condition. Item will be well packaged and shipped by tracked delivery. This is a wonderful condition Lidded Children's Baby Drinking cup with spout. Part numbers are 2441 and 2442. Well, dilly dally no more - the week has arrived. I have so much of it, I don't really know what to do with it all. The bases are a shiny putty colour and the covers are a matt yellow colour. THERE ARE 13 BASES SO ONE IS SPARE. 7 Vintage Small Pastel Coloured Plastic Tupperware Cups/Tumblers / Beakers. Condition is Used. Dispatched with Royal Mail 2nd Class. 2 x Vintage Tupperware Beakers/Cups. Both Beakers are approx 11.5cm Tall.Very good condition. 4 x Tall beakers, perfect for lemonade or fruit drinks for young children. Ideal for caravanning, camping or camper vans. Fashion Accessories. Product Title. Baby & Toddler. Sport & Leisure. Outdoor & Garden. Bowl 7cm diam 5cm tall. Cup 8cm diam at the top 9cm tall. Clear acrylic at the top with a lighter turquoise band for stacking and a trendy frosted acrylic at the bottom. 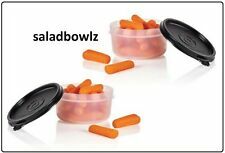 A genuine and very practical Tupperware large salad/fruit salad serving bowl/container sold with its original lid. The bowl has a very pleasant 'grainy' texture and the lid has a "3D" effect. The bowl is light green and has 2 handles. Servalier Salad Bowl Container with Butterfly Handles. Capacity: 6 cup. Tupperware 3 in 1 Divided Canister. Dark Orange Seal, Orange Adjustable Dispenser Spout. Vintage Tupperware Mix N Store #500-7 8-Cup Measuring Batter Bowl 1977. Condition is Used. Good condition, no lid. Thanks for looking...i will ship out fast! NEW TUPPERWARE 10L 42 cups. Condition is New. Shipped with FedEx SmartPost. NEW Tupperware Salt & Pepper Midgets Shakers Purple 2 oz. Airtight Travel Set. Measuring cups with markings for 1 oz. 1 1/2 oz. & 2 oz. Great for liquid medications. Condition is New. Unique special addition item no longer available for purchase through Tupperware. Shipped with USPS First Class Package. CrystalWave Plus. Great for Lunch ! 4 Cup / 1 Liter Capacity. NEW Turquish container with Rhubarb Vent. Rocker Vent. Rocker vent opens easily. NEW/Turquish container with Rhubarb Vent. Textured convenient handles provides cool to touch non slip grip. CrystalWave 16 oz Microwave Soup Mug. New Improved Crystalwave PLUS. Virtually airtight and liquid-tight seal takes mug from fridge to lunch box, to microwave, to table. Ideal for quick eggs in the Microwave! 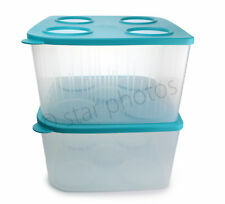 New Tupperware CrystalWave Plus Rectangular Container. - 4 cup (1L) Rectangular Container with Seal. Just pop the steam vent and leave the seal in place to prevent spills when reheating. Container features textured, scratch-resistant bottom. Classic Mixing Bowl. Capacity: 8 Cup. Tupperware Mega MAXI Thatsa a Bowl 40cups With Seal New!!! Four 6" cereal bowls, one seal. four 4" snack bowls, one seal. five 5" x 4 1/2" rectangles, one seal (noticed after taking photos, yellow has 1 1/2" crack on side). 9" bowl, 12 cup capacity, with seal size Z.
Modular Mates Cereal Storage Container. Capacity: 12 Cup. CrystalWave Plus. Allows air to circulate under container, ensuring faster. and more even microwave reheating. Dishwasher & Microwave Safe. Improved Stain Guard. Virtually air-tight seal lets steam escape. Tupperware Stuffables Storage Bowls. 1 cup, 2 cup & 3 cup Capacity Container. Just pop the steam vent and leave the seal in place to prevent spills when reheating. Stackable, modular shape maximizes refrigerator space. Container features textured, scratch-resistant bottom. 4-cup/1 L Rectangular Container with Seal. Tupperware is one of THE most well known and quality made products on the planet! Hands down! This 4 piece canister set is NEW. Original plastic on inner canisters. Original paperwork. No cracking. Tupperware Heat N Serve Square Round Container. 'Cosmos' Gray/Black with Red Vent. New Tupperware Rectangle Crystalwave Microwave set Light Pink 9.5, 7 & 4 Cups . Condition is new . Shipped with USPS Priority Mail.